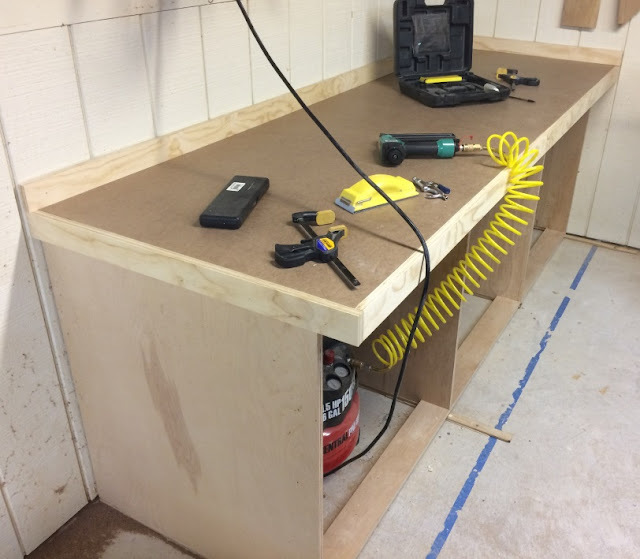 The top of the bench is made up from a foundation of 2x4s that use half-lap joints joinery topped by a sheet of 3/4" plywood with a hardboard top. 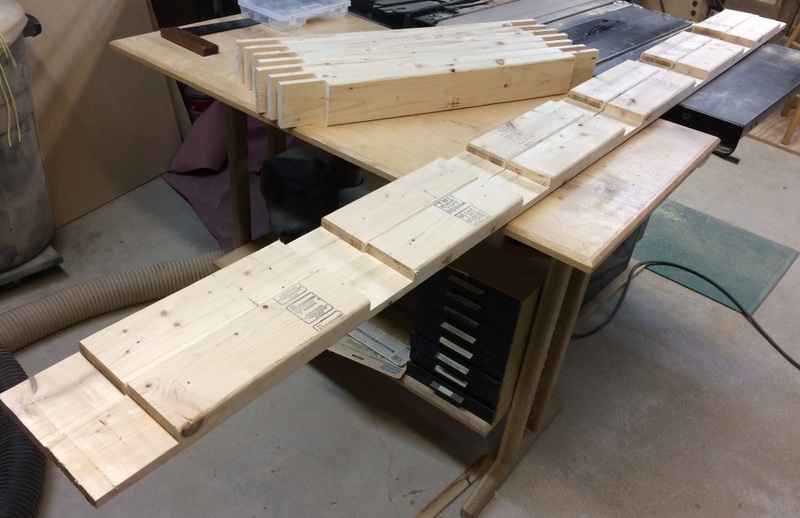 The 2x4 frame has two long braces that run the length of the top with seven shorter cross braces joined with half laps. 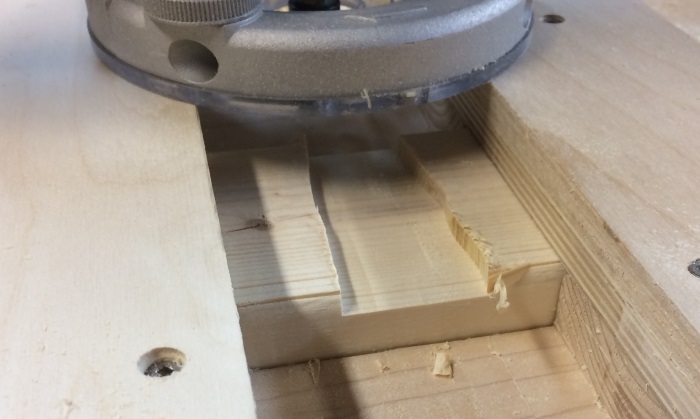 Norm used his radial arm saw with a dado blade to cut all the joinery. I used to have one on long-term loan but I returned it a number of years ago for reasons I won't go into here. 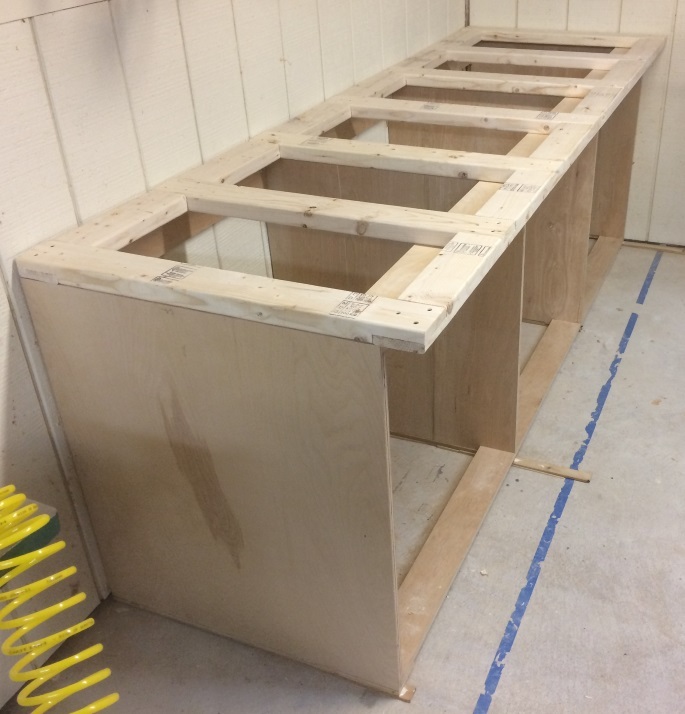 However, I still need to put seven dados across two 96" board. Even if I had the space in my workshop to push a 96" board across my table saw with a dado blade it wouldn't be safe. I thought about using my circular saw to cut a bunch of grooves then break the pieces out with a hammer and then clean it up with a chisel. 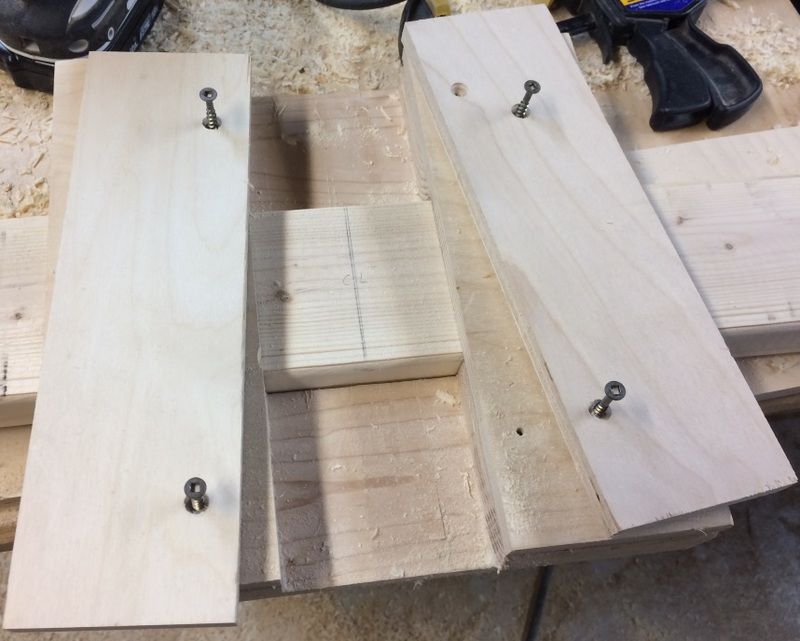 That might work for one or two but not the 14 dados on the long pieces. What I decided to do was make a template I could use with my router and a pattern bit. I could have used a collar but I hate having to do math and I figured the jig would come out a lot more accurate if I used the work piece for sizing. The downside is that I have to have the bit extended far enough that the guide bearing on the bit runs against the jig. I've got to remove a total of about 3/4". The first pass takes about 1/4" and is pretty easy. The second pass is removing almost a half inch and is a little more challenging. I just took it easy and it went okay. I took the middle and worked out towards the sides so that my last pass would take a small amount to get me a clean shoulder. Did it make a lot of saw dust? Yes, yes it did. After getting the long pieces done I did the short pieces by using my table saw set up with a dado blade. I used the fence to control the width of the rabbet. This went much quicker than routing all the dados and rabbets on the long pieces. The next step was to glue them up and put screws in all the joints. That went pretty smoothly. 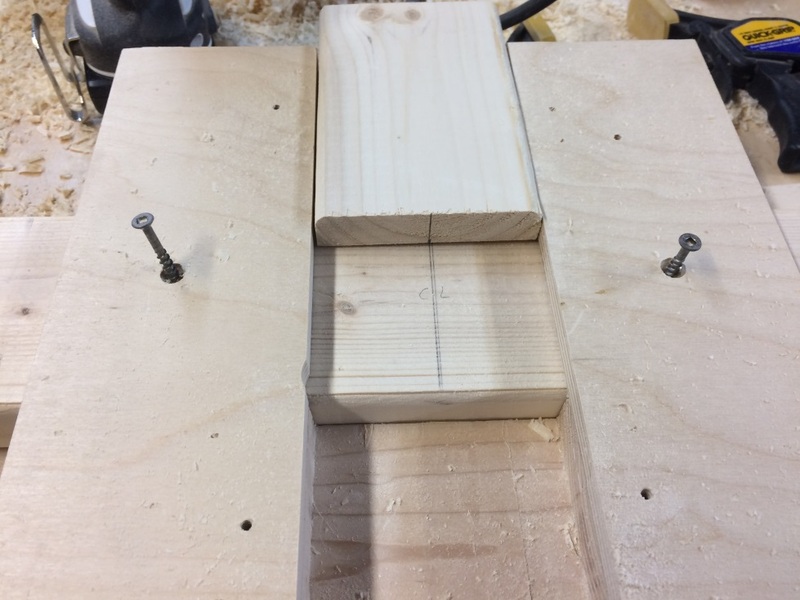 When I'd marked the long 2x4's I'd made sure to mark the ends and then mark both at the same time. This way if my measurements were off they'd be off the same amounts on both pieces. 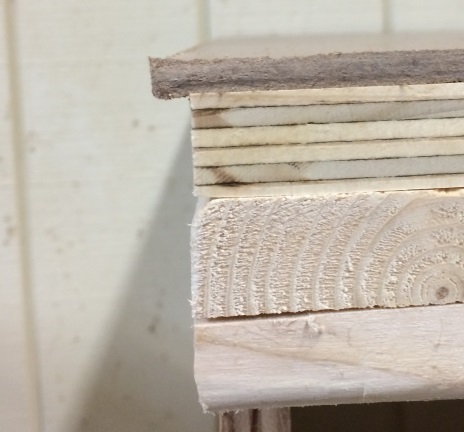 The half-lap joints made it naturally come out pretty close to square. I'd jumped the gun a little bit. I put the top together before shimming the cabinet level. I set my top aside temporarily so I could shim the cabinet. 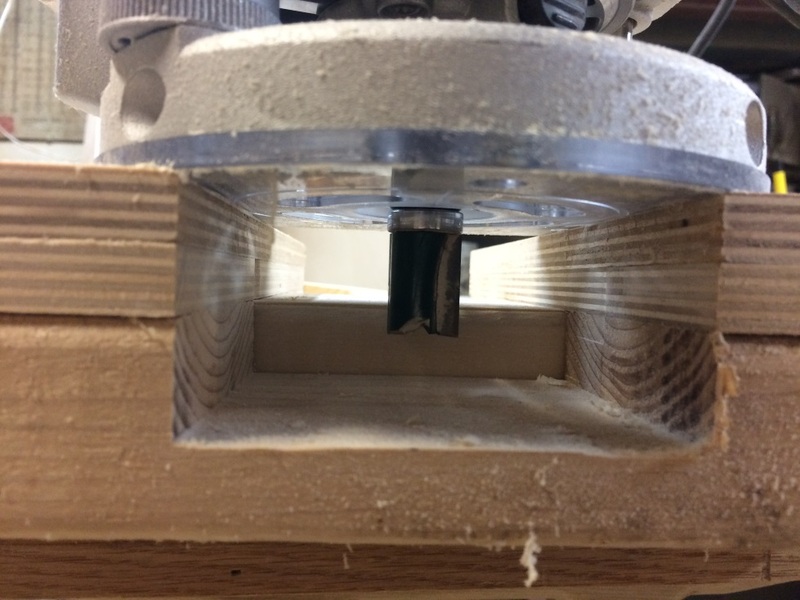 I'd been putting it off because I wanted to make sure I had my final placement determined before gluing the shims in place. No more time to dither so I shimmed the cabinet level. The front left corner is at least an inch lower than the back right corner. Yikes! Then it was a simple matter of fastening the cabinet to the wall and putting the 2x4 frame in place. The frame got screws through the frame and into the wall and through the front horizontal strap into the frame. 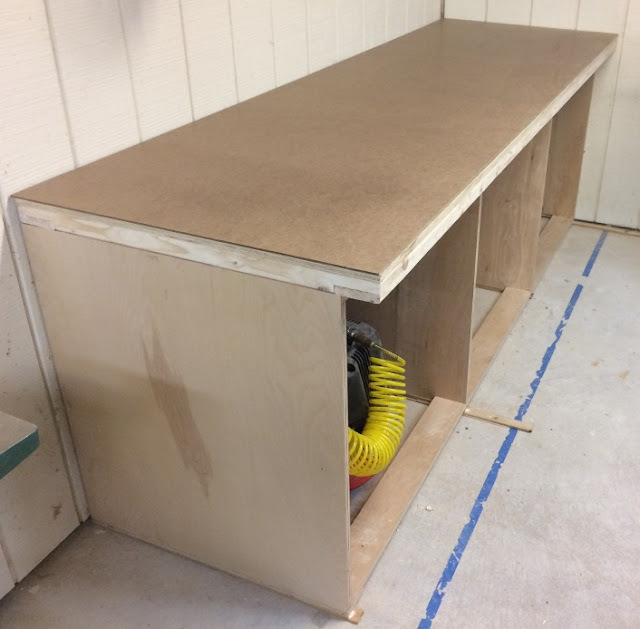 The plywood top and hardboard was pretty easy. I just set my table saw to the right width and ripped them to width. The plywood got fastened to the frame with screws and the hardboard is just set on top. Wouldn't you know it but the hardboard was about 1/4" too long. The easiest way to remove the excess was to use a flush trim bit in my router. I ran it up close to the wall, then flipped the hardboard over so I could get the little bit I couldn't get because the router can only get so close to the wall. It left a fuzzy edge but a little sandpaper on a sanding block took care of that. Norm put hard wood around the top from his scraps. In his video it looked like quarter sawn white oak but he suggested any durable hard wood. I have plenty to choose from; however, I've moved it all to my auxiliary storage and it isn't convenient to get any one board out. So I decided to trim it out with some of my plywood scraps. I just tacked them in place with some brads so when it's time to replace them I'll just pop them off and replace them with hardwood. I think that's pretty good for a second afternoon of work. Next up is the drawers and trays. Tonight I'm going to figure out the layout.